It’s sure been awhile, hasn’t it? We’ve been missing you—a lot. More than chocolate cake and bacon, kind of missing. Time has seemingly flown by at light speed since our last post, but we’re back! The new kitchen is set up, and our excitement and burners are fired-up (and in today’s case, so is the grill)! The warm & sunny weather has arrived in Southern CA (did it ever leave? ), and with it comes fresh, sweet white corn. When these beauties hit the market, I jump a the opportunity to cook with them. Sometimes I opt to make a batch of our corn soup, but it’s been pretty warm, so we’re going outside instead. Dinner was decided to be tacos and fresh guacamole, and then I found myself in a Mexican street corn daydream—the kind of corn I used to order at the local fair. Oh, that savory decadence with a sweet crunch, all on a stick . . . completely covering your tastebuds, face & hands in mayo & cheese, very logistically awkward, yet awesome. Could it have really been years since I’ve had some?! No more time to waste, this dream should be dinner, so I got the corn to make a version of this addicting street-corner staple. It’s really simple, flavorful, and hopefully no one will notice I ate half the pan while making the tacos. You should see my face. Traditional street corn, or elotes, combines fresh corn cobs, mayonnaise, mexican crema (in our case sour cream), and cotija cheese. It’s fantastic! I decided to cut the corn off the cob, and make a slightly less-messy side. I also lightened this up using less mayo and light sour cream (we didn’t skimp on the cotija however, it’s mandatory). We’re giving this a little heat with cayenne pepper, and I thought smoked paprika would also work well. We round this out with fresh lime juice and cilantro. Tacos? Do we even need the stinkin’ tacos? Remove corn from grill, let cool enough to handle. In a separate mixing bowl combine: mayo, sour cream, lime juice, zest, paprika, cayenne, salt, black pepper and whisk well. 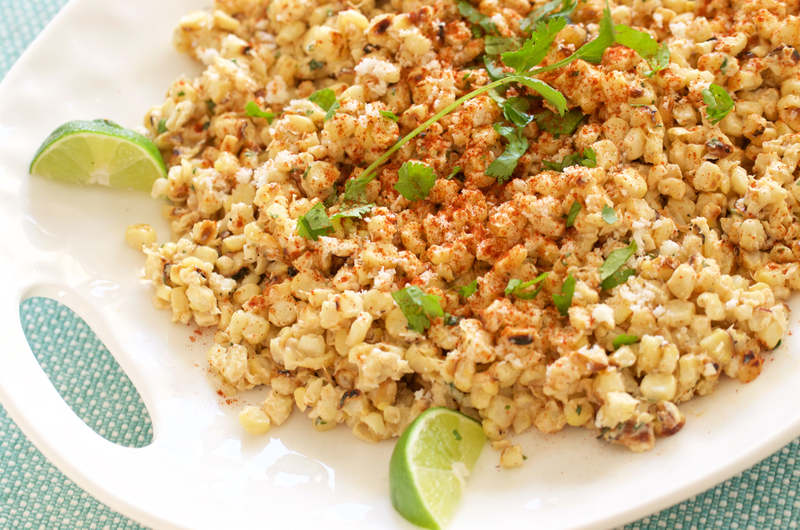 Add ~ 3 tbsp of the mayo mix into the bowl with corn kernels, mixing to combine, then add the cilantro & cotija cheese until incorporated. Add additional sauce & cheese as desired. Garnish with cilantro leaves & lime wedges & sprinkle of paprika on top, serve warm. Add more heat to this with additional cayenne pepper. I couldn’t have liked this more—unless there was more of it. The sweet smokey flavor is perfecto. I think you’ll enjoy this during a weeknight, or anytime you require a quick side. It’s time to eat—hope you enjoy dinner this much too.